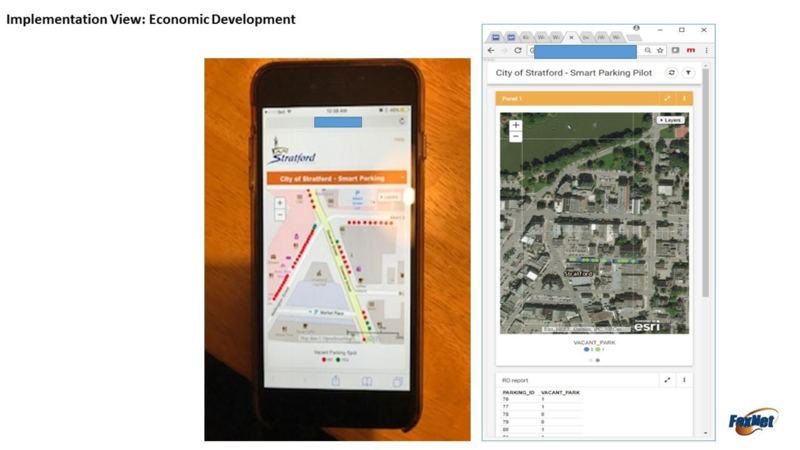 The CBC has written an excellent summary of the Smart Parking application that FoxNet Solutions has been implementing in Stratford, Ontario. In this blog, we explain how this pilot project is built and the technologies used to implement the solution. We describe this case study using the Open Alliance for Cloud Adoption’s Hybrid IT Strategic Planning approach. The Business view defines “Why Bother.” The Business view explains what the business Scenarios/problem/goals that requires a new technical solution. The Business goals of the smart parking initiative project in Stratford are infrastructure planning, economic development, and citizen engagement. The data collected from the sensors is made public via open data in partnership with Canada’s Open Data Exchange. This enables entrepreneurs to access the data and develop unique applications that can guide visitors to restaurants, retail establishments, or theatres. Reducing the time to find a parking spot increases the time visitors will spend in Stratford, which enhances economic development. The commitment to open data has also proven to be an excellent way to generate creativity and entrepreneurial spirit. Both the city of San Francisco and Seattle have implemented this type of approach. Ultimately, an initiative like this helps the City of Stratford improve city planning and parking development activities to ensure that visitors are not frustrated when looking for a parking spot in unfamiliar areas. The functional view defines the data collected and the uses cases required to solve the Business Scenario/Problem/Goals. In any IoT project, there are three categories of data movement. (1) People to things, (2) people to machines, and (3) machines to machines. 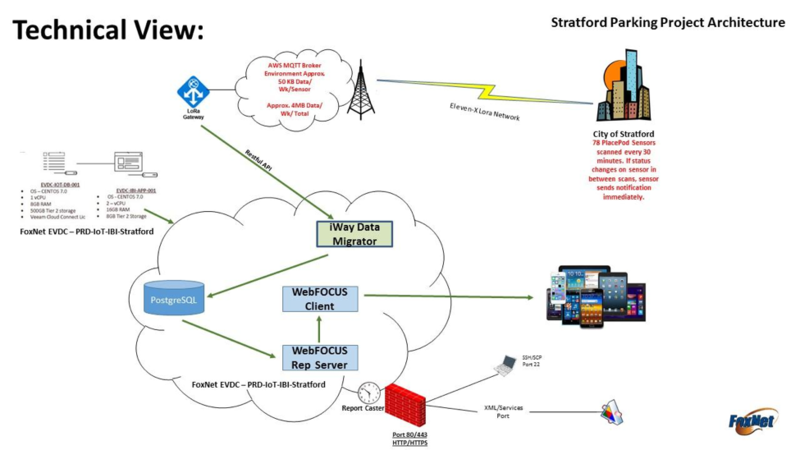 The Stratford IoT Pilot Project is a relatively simple data collection exercise. The status of the parking spot (occupied, or vacant) is collected from 78 sensors in real-time. This data is merged with the GPS location of the sensor and the time of day. The sensors are then scanned every 30 minutes to update the status of the parking spot. If in between scans a parking spot is occupied or vacated the sensor automatically notifies the MQTT broker of the status change and the broker informs the IBI analytics platform of the change. The sensors communicate through a LoRa network using an MQTT protocol. These raw data messages are translated into restful API messages. These restful API messages are further translated into a data repository to enable analytics and report writing. Parking spot visibility that show parking spot usage by time of day, and day of the week. Reports that show parking spot usage related to local businesses. Also, in this specific case, Stratford elected to open the data to the public and to be in accordance with their own internal open data policies. This resulted in open datasets being published for use by local Stratford businesses and entrepreneurs. The technical view defines the best technical architecture to implement the functional use cases. An IoT project requires technical decisions to be made in four areas. These areas are described in the following graphic. Stage 1 defines the sensor technology to collect the data. In the case of Stratford, sensors were chosen that have built-in processing capability. These sensors can distinguish between a car being parked in the parking spot vs. a truck which is passing by the parking spot. They also contain the technology needed to communicate to a LoRa network. Stage II defines the mechanism of data aggregation. There are several methods of data aggregation and collection including data acquisition systems, PLCs, and industrialized computers. In the case of Stratford, the amount and frequency of data collected is not substantial, so a cloud-based MQTT broker is implemented to aggregate the data. 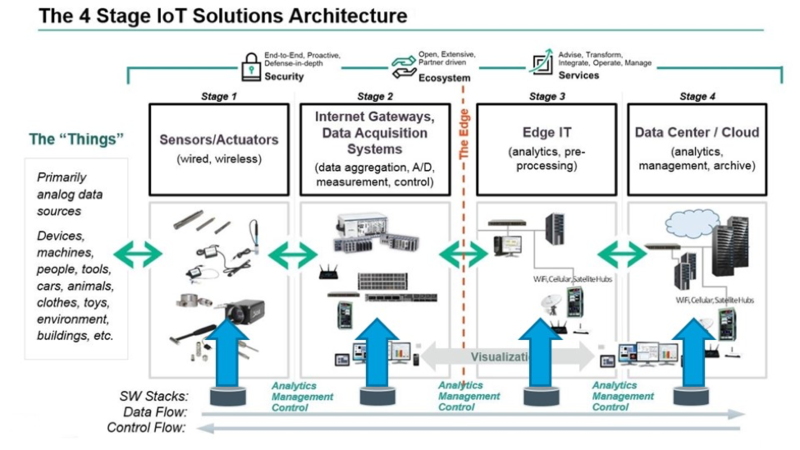 Stage III In IoT projects where there is a significant amount of data being collected, and the frequency of collection is high, it is necessary to add an edge processor to pre-filter the data and run some initial reports. These edge processors are also able to do real time predictive analytics alarming. This function was not required in Stratford, but can be added as an option if they so choose in the future. Stage IV defines where Analytics and Reporting are processed. Analytics software may run in a company’s data centre or in a cloud provider. There are also software as a service (SaaS) providers available that provide IoT services. These SaaS providers are often used when there is a need to coordinate the activities of multiple companies. 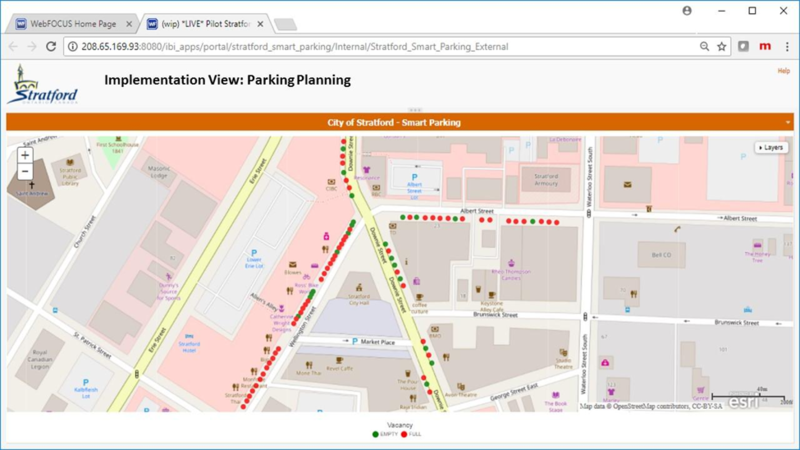 The Stratford parking project architecture uses PNI PlacePod sensors to sense the status of a parking spot and collects the data using the Eleven-X LoRa network. An AWS MQTT broker aggregates this data and publishes it through a LoRa gateway. The IBI IWay Data Migrator product retrieves the data from the LoRa gateway using restful API access and translates the restful API messages into a data repository. The PostgreSQL database provides information to the IBI WebFOCUS rep server and IBI WebFOCUS client to reduce the reports. The entire IBI Software stack relies on the FoxNet public cloud service. The implementation view defines how the data is collected and reporting tools are implemented as well as what changes are required to an IT operating model. Most IoT projects are implemented in two phases, a pilot phase and a production phase. The pilot project often operates independent of the IT operating model, but the production project is deeply integrated into the IT operating model. 75 percent of IoT projects will impact the IT operating model of an enterprise. If IoT projects are not approached properly they can open many new doors for security problems which requires additional security and system management, system monitoring, and change control procedures to be implemented. 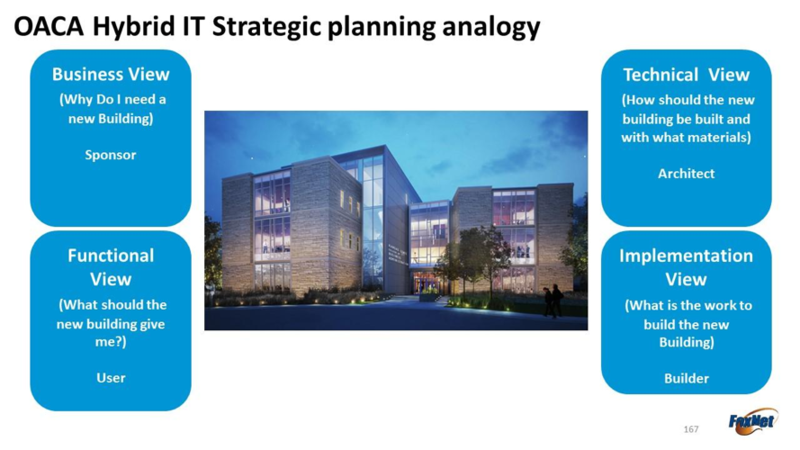 In the case of Stratford, we are still in the pilot project so the impact of the pilot project on the IT operating model is non-existent, however as we scale this project we will begin an in-depth assessment. The pilot project collects data from the 78 sensors with the IBI analytical platform acting as a single repository which produces all required reports. Here are a few examples of the types of reports that are available. 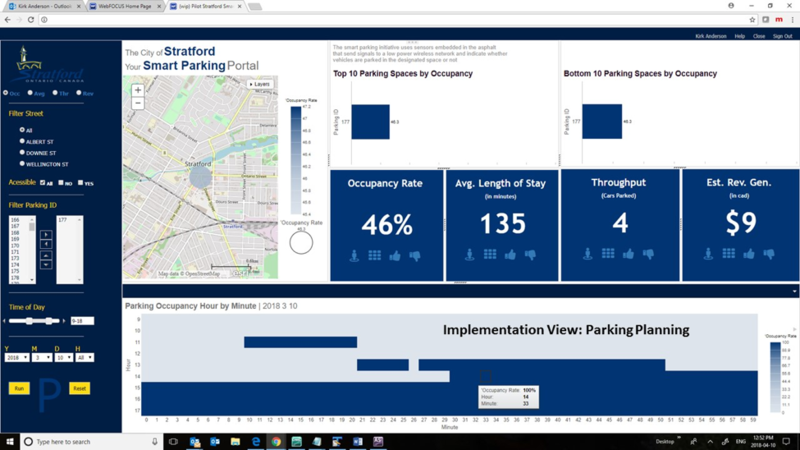 This report presents the real-time occupancy rate of all 78 parking spots. This report produces the infrastructure planners with a detailed heat map of usage which can be filtered by time of day and frequency of use of specific parking spots. This is a mobile application that can present the actual parking spots available. The development of this application allowed the City to speed up the development of their open data policies so they could get the data into the hands of local entrepreneurs as well as the general population. Automatic parking spot payment. When a car parks, the customer’s Bluetooth enabled app logs on to the parking sensor and the City parking application. A customer selects the parking time choice and it’s paid. Autofill the meter option. If the customer is late, the app automatically pays for another hour. Provide the ability to display all parking spots where the time has run out enabling Parking Enforcement to quickly ticket offenders. Restaurants and merchants can provide walking directions to their establishment from any parking spot. Enhanced parking enforcement where officials know exactly which spots are expired. Enable a city landmarks tour starting at any parking spot. It could describe what happened here in history or what TV shows were filmed here. For example, Murdoch mysteries was shot here. The App could then be linked to the actual scene on the web. To help our customers identify where IoT solutions may be of assistance in their municipality, FoxNet has developed an IoT Conversation for Cities workshop. During the workshop, FoxNet presents detailed case studies of cities that have implemented IoT solutions to address these common City issues. FoxNet facilitates a discussion on each of these areas, and collects IoT Business scenarios and Functional use cases from the workshop attendees. The result of the workshop is a report containing a list of potential IoT pilot projects that a city can undertake to address these issues.